The 2015 UK General Election day arrived in a flurry of online activity. Would this be the the United Kingdom’s first “Social Media Election?” Would Social Media start to rival the more traditional forms of media – television and print – in terms of influence? Whilst the main political parties were being criticised for their cautious campaigns – viral campaigns and internet memes based on boybands and, the seemingly implausible, #milifandom seemed to take hold. Parties turned to celebrity vloggers to sway us in to voting for them. Wasn’t this important? After all, recent research from Ipsos MORI said that a third of young people thought that Social Media would influence their vote? I have been really enjoying working with The Conservation Volunteers on their social media content and was delighted to be invited to prepare and delivery a workshop on beginners social media skills, focusing on Facebook and Twitter. The workshop was part of TCV’s ongoing People’s Health Trust‘s HealthStrong CIC funded project in Blackbird Leys, Oxfordshire. The People’s Health Trust believes in a society without health inequalities and working to ensure that where people live does not unfairly reduce the length of their life, or the quality of their health. But how does using Facebook and Twitter help reduce health inequalities? The UK Government’s Digital Inclusion Strategy (updated December 2014) believes that reducing digital exclusion can help address many wider equality, social, health and well being issues such as isolation. 81% of people over 55 say being online makes them feel part of modern society and less lonely. 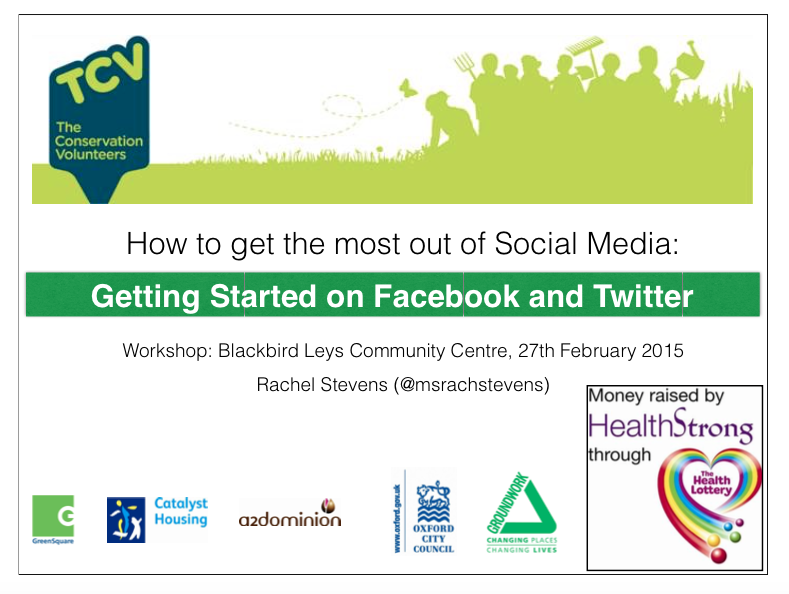 I was asked to deliver a workshop focusing on beginners social media skills, to help people to start to interact online. It seemed sensible to focus on Facebook and Twitter. These two social media platforms are currently the UK’s most popular, Facebook is predominately used for informal contact between family and friends and Twitter is great for following news as it breaks, live events and having real-time conversations. It was very interesting to talk to the workshop participants about why they wanted to use social media and what concerned them about using it. Most people wanted keep in contact with people, but also wanted to use social media more effectively for promoting local causes or businesses. However, nearly all the participants were very concerned about online privacy and this was the main reason why they didn’t use social media more. The first workshop took place in the well appointed computer room in the Blackbird Leys Community Centre, which meant the workshop format could alternate between PowerPoint presentation (participants were invited to ask questions at any time) and letting people put what they had just learned in to practice. Staying Social: Where can you find more help & information? The content of the course was written to all have relevant local content and I thought it was particularly important to signpost participants to where they could find more help getting online in their local area. I certainly learned a lot from writing the workshop material and enjoyed my first experience of running a training course. I hope the participants felt the same. The content I am helping write for The Conservation Volunteers can be found on their Berkshire Facebook page and on their Berkshire Twitter account. But I also rather believe in conscious consumption. As someone with a ‘green’ ethos, I worry about our disposable society and what kind of environment our baby son will inherit. And well, I just like old things, I love things with quirk and charm and character. I love things that are unique and if I can achieve some of those things through a good old bit of re-loving, then that’s just fine with me. 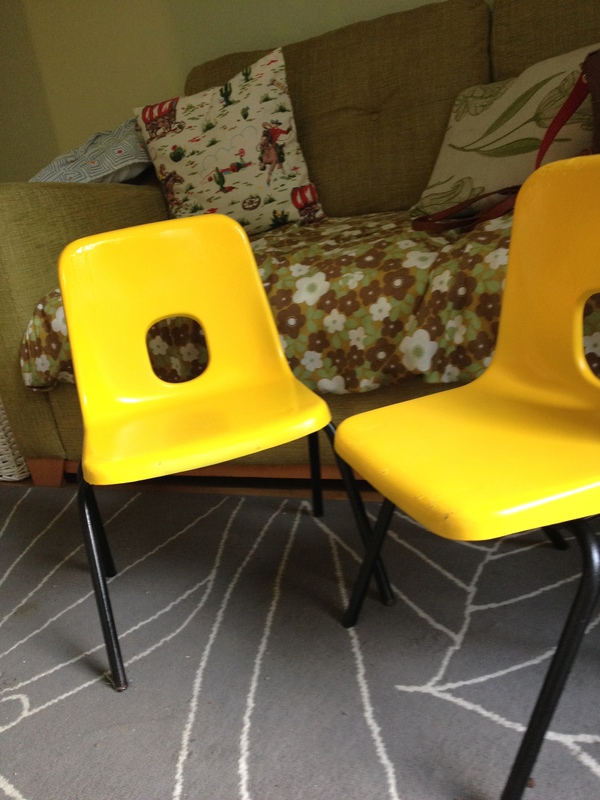 The chairs came from a playgroup, via a reclamation yard in sunny Margate for a whole Four British Pounds (tip: avoid the ridiculously overpriced ‘vintage’ shops in the Old Town and head up the hill past the Shell Grotto to the real thing). 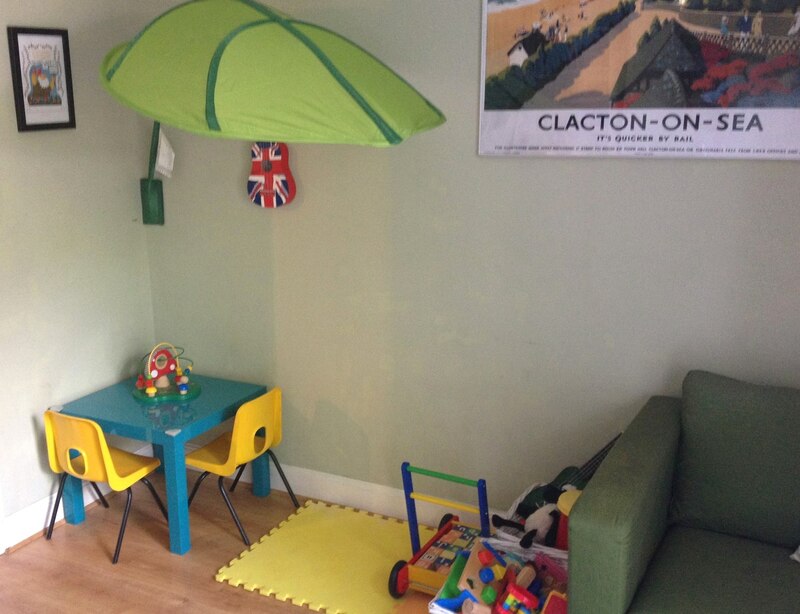 Covered in rust and grime, but proudly Made in Britain, I bequeathed them a stay of execution from the scrap heap and after lugging them home on the train (that lovely parquet floor above is in Ramsgate station), set about transforming them for our little boy. 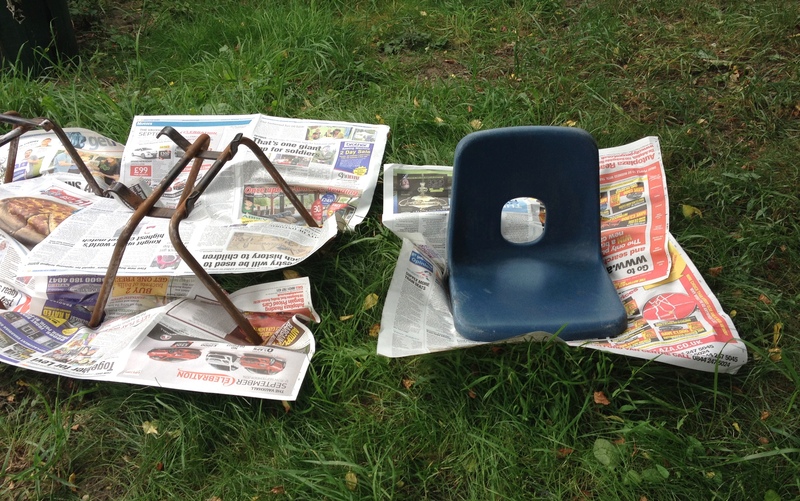 It took me HOURS to sand all the flaking plastic paint and rust off the metal legs. It took me ages to scrub the plastic clean with sugar soap, so they could be primed and painted. But, after a lot of hard work, a couple of emergency trips to Wilkos for more cans of paint and a lot of cursing, they were transformed in to my primary coloured dream. Can I be honest with you? Was it worth it? In principle, I still believe – yes. These perfectly useable chairs have been saved from landfill and given a new lease of life and I love the colour of them. But, to get this finish on them took two cans of Plasticote paint (not including a coat of primer and lacquer) and two cans of spray Hammerite on the legs. That’s not only a huge amount of money to spend on £4 chairs, that’s an awful lot of VOCs released in to the atmosphere! 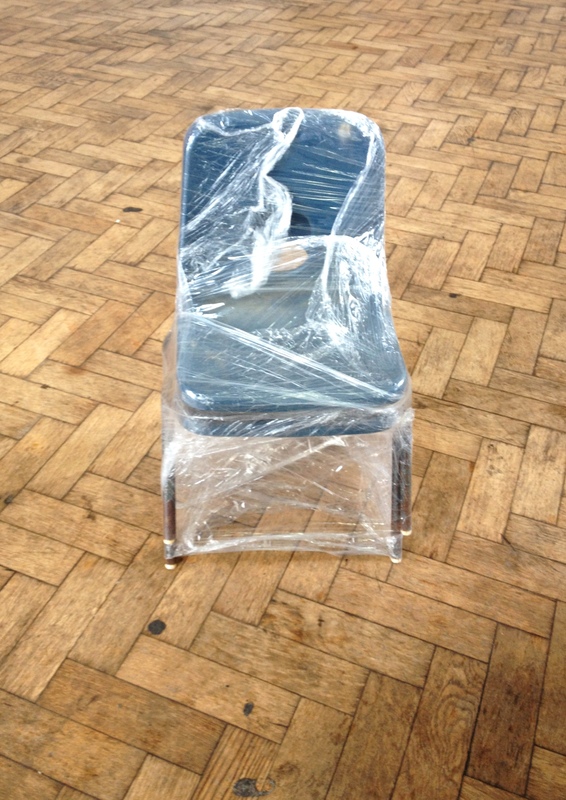 After all the materials needed to save them from landfill, do they really have better environmental value than new chairs? 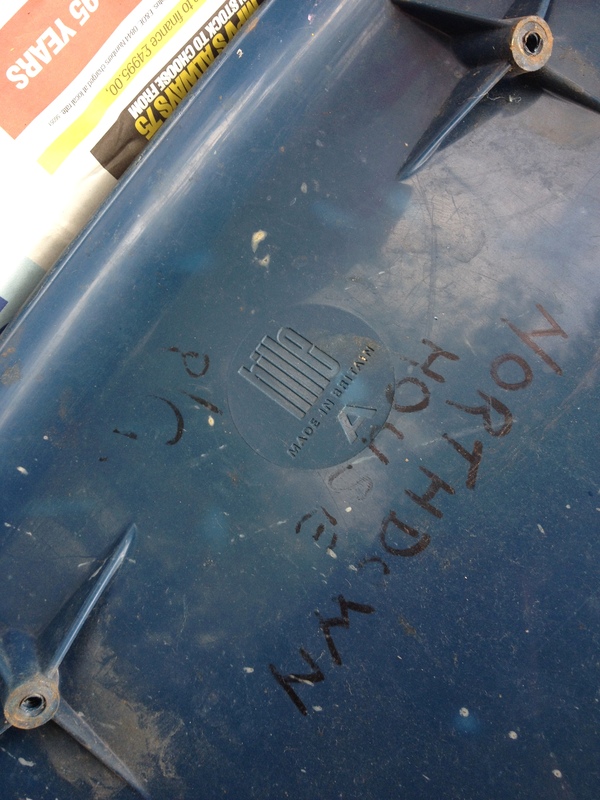 What is the real environmental impact of the upcycling trend? However, despite the resulting costs and imperfections, we really do love them. And paired with a table from IKEA (I had planned to upcycle a table but this one was just too perfect. IKEA appear to have quite strong environmental credentials. 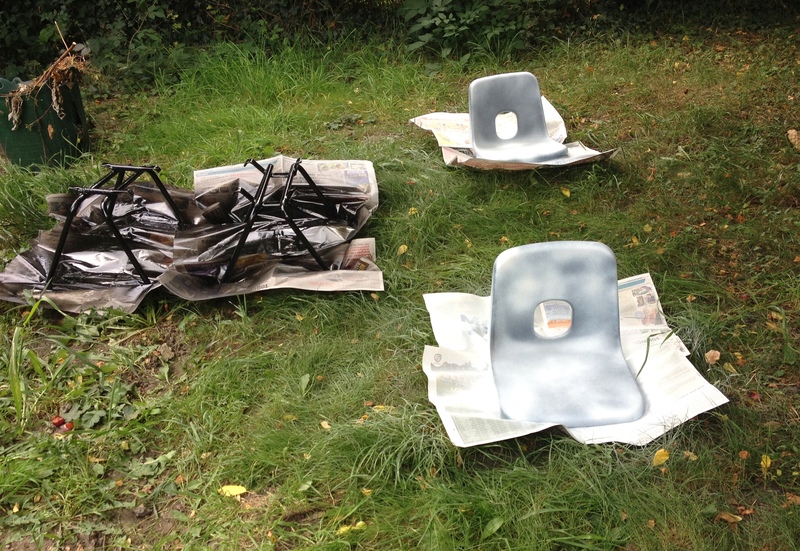 And it cost a lot less than all that spray paint…), we think they make the perfect pieces for our little boy’s play area. And to him, that’s really all that matters. This post originally appeared on my personal craft blog. You can’t replace real life interactions, but what role can social media play? However, after setting up a Facebook page and Twitter account for The Conservation Volunteers Berkshire a couple of years ago, I am taking a little time out from my extended maternity leave to help them maintain and, hopefully, expand their social media presence. We also use it to connect to wider audience – partner organisations, other interested parties and the wider community. Recently, by using a local hashtag (#rdguk) some work the volunteers had done at the local community sports stadium was widely retweeted by a plethora of community members, private companies, local politicians, generating much feedback and thanks. Giving the volunteers’ work the status it well deserves. Social Media can quickly share what we have been doing far and wide, helping us raise the profile of ourselves and our funders. *As always the view expressed on this blog are my own and not those of any other organisation. You know planning reforms are definitely hitting the news when they come to the attention of observational comedians. David Mitchell wrote an interesting article in yesterday’s Observer about the possible impact of a proposed relaxation of planning regulations primarily concerning changes of use on our town and city centres. 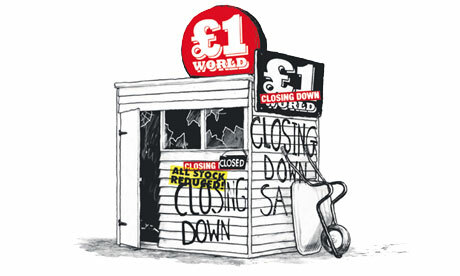 Is planning really to blame for the malaise on British High Streets and can it possibly provide a solution? Does planning protect our retail centres or does it merely play in to the hand of developers and create artificial ‘retail only’ environments in towns? Could a relaxation of planning regulations make town centres more flexible and more responsive to the needs of their communities? Whatever your views, David Mitchell’s observations are well worth a read, find them online here. What do you think of when you think of the Reading Festival? Rock and roll? Loud music? Mud and debauchery? A haven for biodiversity? Perhaps not. 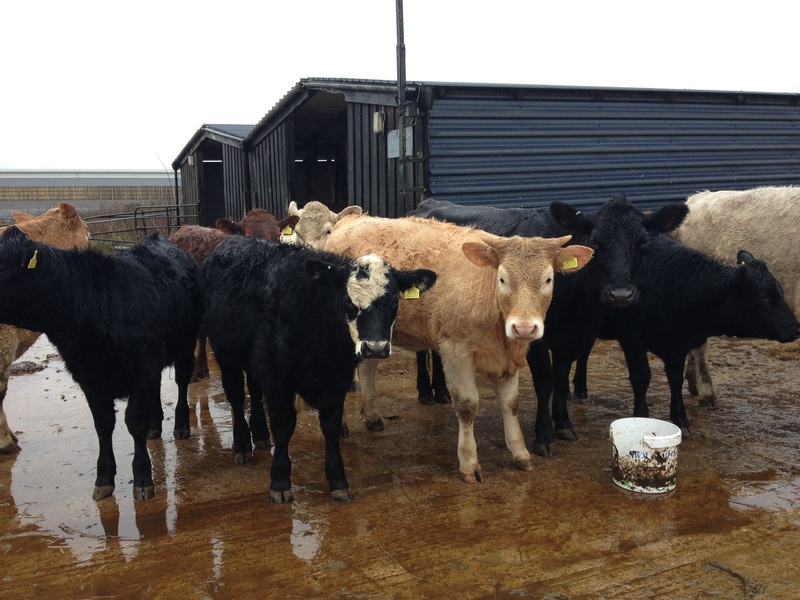 But the Festival site, known the rest of the year as Little Johns Farm, a working cattle farm, has some hidden secrets. One of which is an old nuttery, a nut orchard, which Reading Borough Council, The Conservation Volunteers and Reading Tree Wardens are restoring. As part of the Biodiversity Management Plan for the site, Reading Borough Council proposes to plant nearly 300 hazel trees in the nuttery. 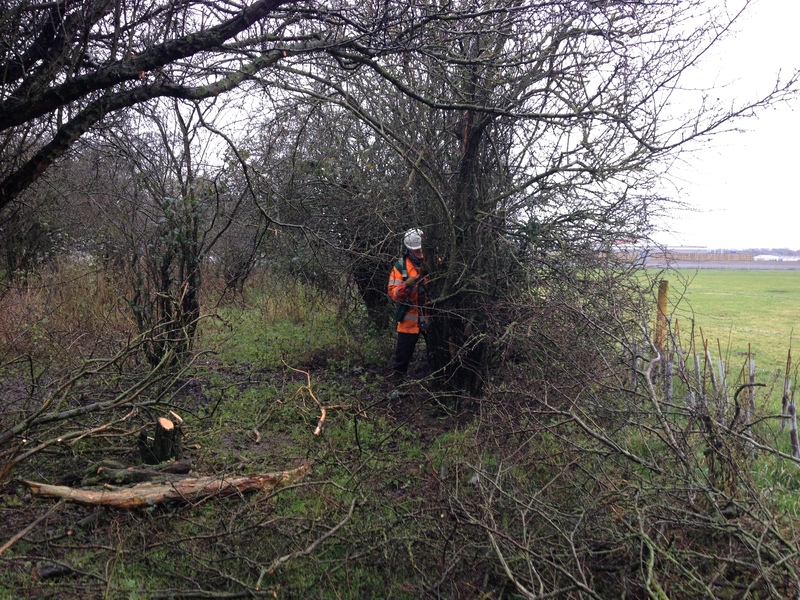 However, before the new trees can be planted, existing trees and shrubs – such as blackthorn – need clearing and coppicing to open up the site enough to accommodate the new trees. It is hoped that the nuttery will increase biodiversity on the farm, which is largely grazed pasture in the floodplain of the River Thames. Habitats, such as badger setts and log piles for invertebrates are also being created. Little John’s Farm is a private site (apparently the Council work closely with the site owners due to the community interest in the Festival). It is a shame this nuttery won’t be accessible for public use. However, nuttery creation can be an effective way to increase biodiversity on public sites. Like fruit orchards, nutteries can also be used to create community orchards, which can complement and create diversity in community resources. Some examples of community nutteries can be found in Bath and in Clare, Suffolk. Advice on how to start a Community Orchard can be found here and if you are in the Reading area and would like to learn more about planting fruiting trees, you could join in the restoration of an orchard in Prospect Park with Transition Town Reading on 2nd February. Details can be found here. CommunityPlanning.net is a fantastic resource from, amongst others, the Department for Communities and Local Government and the Royal Town Planning Institute (or RTPI, the chartered professional body of planners). Particularly useful pages are a good overview on policy and legislation on community planning in the UK (interesting the site also provides overviews for the Czech Republic, Italy and Slovakia). There is a rather detailed A-Z section on sources and mechanisms for funding for community-led neighbourhood projects. And I found the section on low carbon communities particularly interesting. If you are in England (outside of London) Planning Aid England is run by the RTPI and can give you 15 minutes of free advice from a chartered town planner and then assess if you are eligible for any further free assistance. Their site includes short guides to aspects of the planning system and a jargon busting section. But the section on Neighbourhood Planning is quite comprehensive (I found the list of where Neighbourhood Plans are currently being developed particularly interested, especially after my post written last year). There are also sites for Planning Aid London (a separate charity run organisation to Planning Aid England), Planning Aid for Scotland and Planning Aid Wales. If you know of any other useful sites, please let me know and I’ll also add to this list as I find them. The power of joining in? Back in June 2012 I wrote about taking part in my first Green Gym session. Today for the first time I led (on my own) a Green Gym session, which was the first of a programme of Green Gym activities that I have arranged for The Conservation Volunteers. In October 2012, The Guardian Healthcare network published a fascinating article about the work Green Gym programmes have done in Leeds and Birmingham. It is well worth a read. I have been keeping this article in mind when working on this season’s programme for our Green Gym. I am minded of the importance of keeping sessions interesting, varied and, most importantly, fun and friendly. But I also believe that it is important that our Green Gym session are accessible. Unlike many other Green Gyms around the country we do not work on a single site, and cover a large part of West Berkshire, a predominately rural area. We now have some fantastic and wonderful ‘regulars’ but I don’t want location to preclude more participants joining in. Participants that might not otherwise get involved in other conservation activities in the area, but would really benefit from the scheme. So the new programme includes reducing the number of sites we visit and having as many sites that are accessible by public transport as possible, while still keeping interest and variation. Transport isn’t the only hurdle to accessibility, and am continually looking for other ways to help the project reach as many people as possible. But it is a start. And hopefully some of our Green Gymers will get the benefits those in Leeds and Birmingham have experienced. If you have any suggestions how to make community projects accessible to as many of the community as possible, I’d love to hear them? 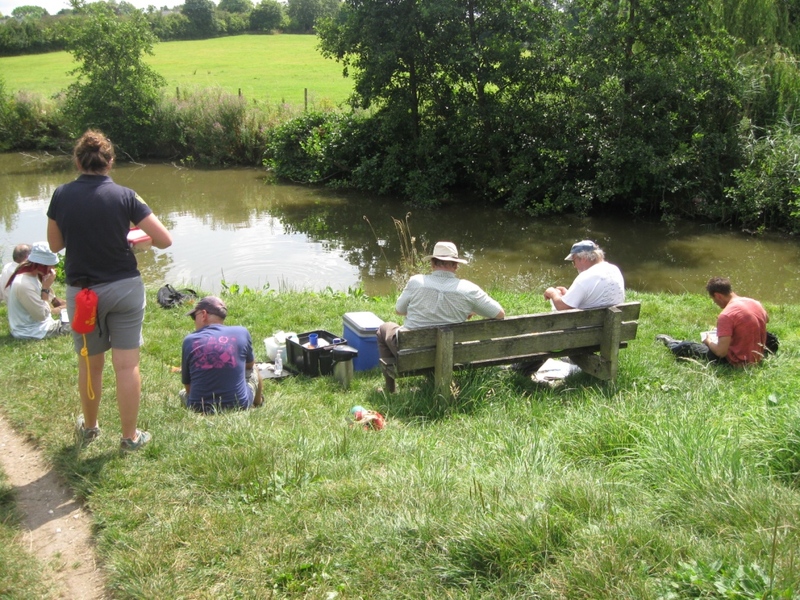 The 2013 programme for the Newbury and Thatcham Green Gym can be found here. This part of West Berkshire is now most famous for being the kind of place that produces princesses. But amongst the grand houses and rolling countryside, one West Berkshire Parish Council is working on a unique community resource – a community orchard. An orchard is a collection of fruit trees. In particular, a community orchard may be owned or leased for or by the community (or held by agreement) by a community group, parish council, or by a local authority or voluntary body. Community orchards should be open and accessible at all times. As well as enjoying the place, local people can share the harvest or profit from its sale, taking responsibility for any work in the orchard (Source). Cold Ash Community Orchard is run by Cold Ash Parish Council. 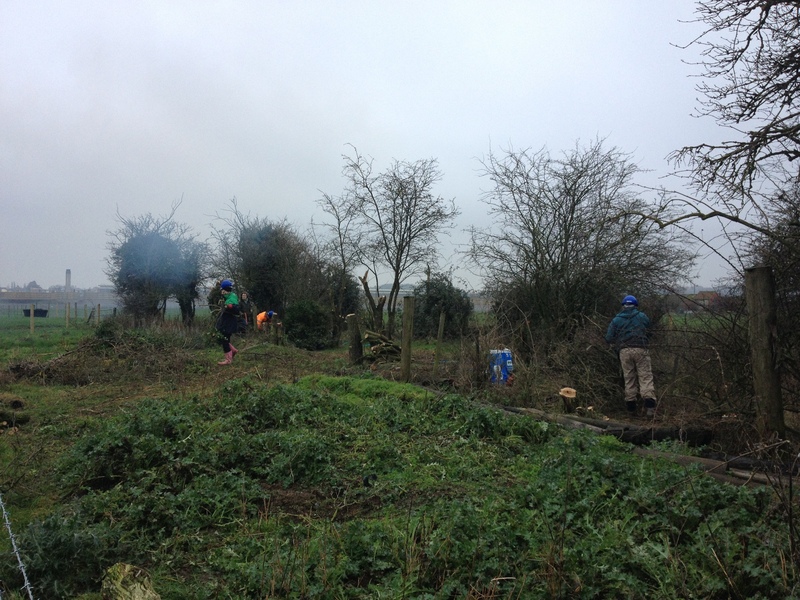 We visited the site with the Newbury and Thatcham Green Gym, to help the Parish Council by planting a new hedge along one of the orchard boundaries. The new hedge comprises native species, such as Spindle, Hazel, Blackthorn, Hawthorn, Cherry and Dogwood Rose. As well as planting the hedge whips, the Green Gym also protected them from hungry wildlife with rabbit guards. The habitat values of hedgerows are well documented. But what particularly interested me about this site was the community resource being provided. Community orchards are currently being actively encouraged by the Department for Communities and Local Government as part of the localism and decentralisation agenda. Community orchards strive to be the focal point for community activities. As well as the provision of acessible open space, they can promote the health benefits of fresh produce and outdoor exercise. Additionally there are opportunities for access to land for food growing and opportunities for assisting those who want to grow their own food (Source: DCLG). Despite being a relatively affluent area, this part of West Berkshire, like many rural areas, still has residents that don’t have access to open space and places to grow food, which can have health implications and also increase vulnerability to food poverty. It will be really interesting to see how this community project developed and how similar schemes might be able to be implemented elsewhere. The Department for Communities and Local Government produce two guidance documents on community orchards: A PDF ‘How to’ guide can be found here and a collection of case studies about of community orchards around the UK can be found here. As a rather proud (albeit ex-pat) Essex girl, with her heart firmly wedded to the Essex coast, I couldn’t resist reading more in to the reports that Grayson Perry has had planning permission granted for a holiday home in Wrabness, near Harwich. But this proposal appears to be no ordinary holiday home. it is proposed that the house will be an artistic interpretation of Essex culture, depicting the fictional life of one Essex woman called Julie, who eventually found contentment in her house by the coast. In the most simplistic planning terms, it is important to point out that the proposed house is on the site of existing dilapidated farm house. Therefore it is a replacement dwelling, a normally uncontroversial planning consent, even in a rural location. It is also important to note that North Essex needs its cultural and tourist offer diversified in order to facilitate regeneration and has planning policies to support that. But this proposal seems a lot more romantic than just the standard planning considerations to me. The House of Essex revitalises the lost art of building follies. “a building constructed primarily for decoration, but either suggesting by its appearance some other purpose, or merely so extravagant that it transcends the normal range of garden ornaments or other class of building to which it belongs”. And Essex is full of follies and extravagant buildings, like Bateman’s Tower in Brightlingsea or Belchamp Hall Folly in Belchamp Walter. You could even include Layer Marney Tower near Colchester – which was originally built as merely the gatehouse for a dwelling that was meant to rival Hampton Court, but was never finished. The Essex Coast is a beautiful and dynamic place. It is diverse and it is romantic. It stimulates and its remote location evokes a sense of adventure. People have travelled to the Essex Coast to find contentment for centuries, from the Chapel of St Peters in Bradwell to the Kursaal in Southend. The county of Essex is much maligned and underrated. The building of the House of Essex isn’t necessary, but in a county dominated by building solely to meet housing targets, it is refreshing to see a proposal that is just for its own sake. In my opinion, any opportunity to celebrate, diversity and create new heritage should be wholeheartedly embraced. Even if it is a folly. All the planning documents for the House of Essex are available to be viewed through the very good (other Local Authorites, please take note) Tendring District Council website.